When you have a magical season like the Mets had in 2015, there are a number of players that step forward to have remarkable seasons. For the Mets, one of those seasons came from the unlikeliest of sources in Sean Gilmartin. With the return of Matt Harvey and the signing of Michael Cuddyer, the Mets were letting the baseball world know 2015 was going to be their season. There was just one small problem. They never could quite get the LOOGY they needed. Jerry Blevins was supposed to have that role, but he broke his pitching arm. Josh Edgin and Jack Leathersich would join him on the disabled list. The team traded for Alex Torres, but he was a disaster. That meant the only real lefty they had in the bullpen was Rule 5 pick Gilmartin. Except, Gilmartin wasn’t a LOOGY. In essence, Gilmartin was a pitcher. In fact, prior to joining the Mets, Gilmarting had spent the entirety of his minor league career with the Braves as a starting pitcher. As a starter, Gilmartin had neutral to almost reverse splits. To that end, he wasn’t the guy you wanted as the LOOGY. Still, Gilmartin knew how to pitch, and when he was given the opportunity, he showed that to the Mets. It took about a month and a half, but Terry Collins finally figured out Gilmartin’s role. Gilamartin becaume the long man out of the pen. It may not be the most glamorous of bullpen jobs, but it is of vital importance. You need a pitcher who can go out there and keep his team in the game. If there is an injury or a starter that just doesn’t have it, you need the long man to give the team an opportunity to make the comeback. In extra innings, you need the guy who can go out there and reliably soak up two or even three innings and put up zeros. Mostly, you need someone reliable who can save the bullpen. 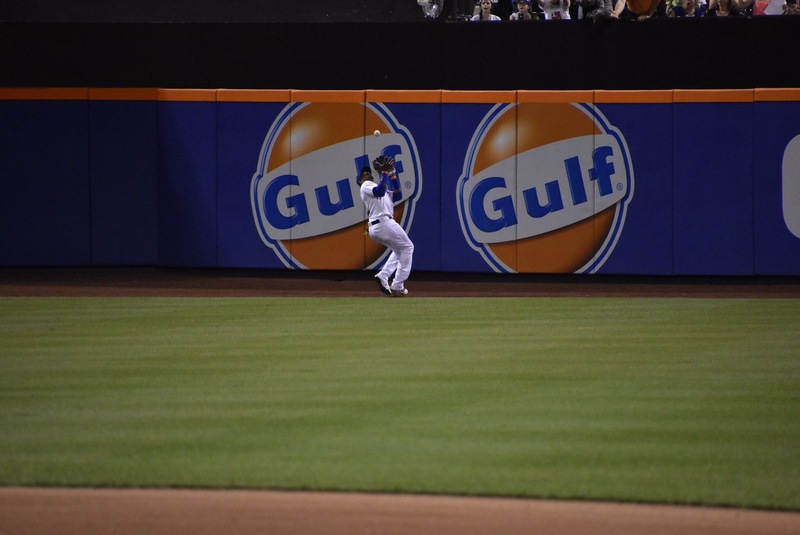 Gilmartin was exception in that role. During the 2015 season, Gilmartin made 18 multiple inning relief appearances accounting for 37% of his relief appearances. Beginning on May 20th, which was really when he was made the long man, Gilmartin made 16 multiple inning relief appearances over his final 33 relief appearances of the season. Essentially, half the time Gilmartin was used for multiple innings about half the time thereby saving the bullpen. Namely, Gilmartin was saving Jeurys Familia, who Collins used over and over again because he was just about the only guy Collins trusted out there. In Gilmartin’s multiple inning appearances, he was dominant. When he pitched multiple innings, he pitched 32.2 innings going 3-1 with a 1.38 ERA, and a 0.704 WHIP. Perhaps the key to this was the fact Gilmartin grew stronger as he pitched. He did his best work between pitches 26 – 50 limiting batters to a .161/.235/.194 batting line. As for a highlight, pick one. There was his first career win. The Mets found themselves in a rare slugfest after Dillon Gee was bounced after 3.2 innings having allowed eight earned. Torres wasn’t much better. Gilmartin was the first pitcher to enter that game to put up multiple scoreless innings. He stabilized the game, and he put the Mets in position to win. There was the July 19th 18 inning game against the St. Louis Cardinals. At that time, the Mets were so inept offensively, you could load the bases with no outs and start the batter with a 3-0 count, and the Mets still couldn’t score a run. Gilmartin came on in the 14th inning, and he pitched three scoreless to give the Mets a chance to win that game, which they eventually did with two runs in the 18th. On August 24th, Gilmartin was overshadowed every which was possible. The Mets were off and running afte rthe team obtained Yoenis Cespedes. It was David Wright‘s first game since he came off the Disabled List, and he homered in his first at-bat back with the team. Lost in the shuffle was this was the rare poor start for Jacob deGrom with him being unable to get out of the fourth. Gilmartin came on and pitched 3.1 scoreless to give the Mets a chance to come back from an early 7-2 deficit. More than that, Gilmartin got his first career hit and run scored. His sixth inning single got yet another rally started. He scored on a Daniel Murphy three run homer, the Mets lead had actually expanded to 12-7. Ultimately, it was Gilmartin’s August 24th relief appearance that was the essence of what it means to be a long man in the pen. He not only went out there and saved the bullpen by tossing 3.1 innings, but he also gave his team a chance to win. It was a tremendous effort that was overlooked because Wright played in his first game in four months, and the Mets overcame a five run deficit to blow out the Phillies. Initially, Gilmartin was left off the postseason roster, but after Erik Goeddel‘s struggles in the NLDS, the Mets did the right thing and put Gilmartin back on the roster. He’d make just one appearance pitching 0.2 scoreless in Game Two of the World Series. Part of the shame of that World Series was there were multiple occasions to bring on Gilmartin. Instead his role had gone to Bartolo Colon, who just wasn’t as effective in the role as Gilmartin. After the 2015 season, the Mets wanted to use Gilmartin as a starter. With a loaded major league rotation, that meant Gilmartin started the year in Vegas. He was doing well there until the Mets started messing with him. With the bullpen not having the effective long man that Gilmartin was in 2015, this meant the team had to call him up to the majors on multiple occasions. This meant Gilmartin would have to fly cross-country, and the Mets would insert him into games despite his not having had full rest. He’d develop a shoulder injury. It may not have been enough to need surgery, but Gilmartin was never the same. Instead of putting Gilmartin in a position to succeed, the Mets messed around with him until the point they felt his was expendable. For some reason, with this Mets team again needing a Gilmartin in the bullpen, they refused to give him a chance instead going with Josh Smoker and Neil Ramirez and their pair of ERAs over 7.00. Gilmartin deserved better than this. He was a good pitcher who had a significant impact on a pennant winning team. It disappointing the Mets never again put him in a position to succeed. With that said, getting designated for assignment by the Mets was probably the best thing for his career. He will once again have an opportunity to be a good major league pitcher. While the Mets have overlooked his importance, and fans have become frustrated with him, there are those that never forgot what he once meant to this team. Personally, I will always be grateful for his 2015 season, and I hope him nothing but success. He’s still a good pitcher, and he should soon remind everyone of that. Thank you and good luck Sean Gilmartin. Here’s the best way to synopsize both this game and the 2017 season ➡️ Dillon Gee allowed half the amount of runs in this game than Jacob deGrom did. And no, Gee was not good tonight. The other run came in the first and was set up when Michael Conforto led off the game with a double. He later scored on a two out RBI single by the red hot Lucas Duda. For his part, Lagares was uncharacteristicly good at the plate going 4-5 with a homer. It wouldn’t matter as deGrom couldn’t hold any lead. He just couldn’t protect a 1-0, 2-1, or a 4-3 lead. He allowed runs in every inning he pitched. It started when deGrom couldn’t get his footwork right in the first inning. Adrian Beltre grounded into what should’ve been an inning ending 3-6-1 double play, but deGrom was searching for the bag with his feet instead of stretching for the throw. Instead of getting out of the inning unscathed, deGrom allowed the tying run to score. In the second, deGrom lost a 2-1 lead. Rougned Odor hit a double after a Jonathan Lucroy single to set up runners at second and third and no out. Hoying hit an RBI ground out, and Delino DeShields followed with a sac fly to make it 3-2. It all came crashing down in the fourth for deGrom. With runners on second and third with no outs, deGrom threw a wild pitch while walking Shin-Soo Choo to make it 6-4. The seventh run scored when Elvis Andrus hit into a double play. Unfortunately, deGrom still couldn’t get out of the inning before allowing a solo homer to Nomar Mazara. It was a tough night for deGrom. His final line was four innings, 10 hits, eight runs, eight earned, one walk, and just two strikeouts. Not too long ago, he seemed to turn the corner. This is now his second poor start, and his ERA has ballooned to 4.75. 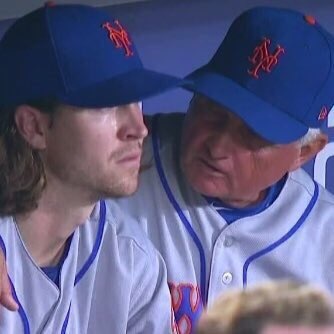 The best thing you could say scour the night was deGrom seems more devastated by his struggles than Mets fans are. From there, the Mets had little choice but to bring in Josh Smoker and his 7.43 ERA into the game. Things could’ve gone worse, but he still allowed two runs over his two innings pitched raising his ERA to 7.56. If you really want to be depressed, consider Neil Ramirez was the Mets best pitcher on the night. The Mets bats went mostly silent after the third with the team scoring just one run in the 10-5 loss. The team was 2-13 with RISP, and they were only able to score one run when they had bases loaded and one out in the eighth. They were one big hit away from getting back in the game. Instead, they made three quick outs. However, the bats reawoke in the ninth. After a Flores lead-off single, Curtis Granderson and Travis d’Arnaud went back-to-back to get within 10-8. After a Lagares single and a Conforo walk, the Mets were really in business. Asdrubal Cabrera struck out, and then Bruce hit into a game ending double play. The Mets need to get going soon because the Nationals aren’t slowing down anytime soon. Game Notes: Duda (2-5, HR) and Wilmer Flores (3-5) continued to hit. Travis d’Arnaud played poorly going 0-4 leaving five runners on base. DeShields also stole two bases off of him. With Noah Syndergaard slated to go on Monday, this marks the sixth straight year the Mets have had a different Opening Day starter. Jon Niese, Dillon Gee, Bartolo Colon, and Matt Harvey each got a turn, but they never got the opportunity to be the Opening Day starter in a subsequent season. Hopefully with Syndergaard, this year begins a long run of Opening Day starts for a pitcher that is on threshold of being an all time great. If Syndergaard does that, he will join nine other Mets pitchers who have made multiple Opening Day starts. Can you name them? Good luck! Back in 2010 when Jacob deGrom was drafted out of Stetson University as a shortstop, you would be hard pressed to find anyone in the Mets organization that truly believed deGrom would not only be a future Rookie of the Year, but also one of the top pitchers in baseball. In fact, deGrom wasn’t even seen as such when he was first called-up to the Mets in 2014. At that point in time, the Mets were in a year of transition, and they were at the point of trying to figure out who could be a part of the team in 2015 when the Mets were really intent on becoming contenders. One of the players called-up was obviously deGrom who was was 4-0 with a 2.58 ERA and a 1.278 WHIP in seven starts in AAA. This was a marked improvement from the pitcher who was 4-2 with a 4.52 ERA and a 1.467 WHIP in 14 starts in AAA the previous year. During said 2013 season, deGrom had made 10 starts in AA going 2-5 with a 4.80 ERA and a 1.483 WHIP. Sure, there were reasons to expect he could eventually pitch in the majors. He was a four pitch pitcher that had a mid 90s fastball and a good slider. When Dillon Gee went down with an injury, the 26 year old deGrom was called up to the majors to make a start in his stead. There was no timetable on how long deGrom was going to either stay in the majors or in the rotation. However, if push came to shove, the Mets were more inclined to move deGrom into the bullpen and let Rafael Montero stay in the rotation. At that point, Montero was seen as a much better and more polished prospect who had good command and was a groundball pitcher. What transpired was deGrom proved that his 2014 AAA season was no fluke. He went on to make 22 starts that season going 9-6 with a 2.69 ERA and a 1.140 WHIP en route to becoming the National League Rookie of the Year. He had surpassed Montero who had not pitched as well in his opportunity and who dealt with some injuries thereby opening the door for deGrom to forever solidify not only his place in the rotation, but also the Mets plans. Right now, the Mets have a pitcher in Matt Harvey who is injured, and that is going to open the door for a pitcher to get a chance to show that they are capable of being part of this Mets rotation. Much like in 2014, the prospects that are battling it out is a 26 year old in Seth Lugo who was never expected to be in this position and a 23 year old pitcher in Gabriel Ynoa who relies upon his control and groundballs to get outs. Much like in 2014, the Mets have deemed the younger pitcher to be the better prospect. In many ways, this could be the case of history repeating itself. So far, Lugo has made one major league appearance. In that one relief appearance, he showed that he has the stuff to get hitters out at this level. Like deGrom, he has seemingly taken his game to the next level once he got called-up to the majors. Right now, the only thing that really separates him and deGrom is the fact that deGrom got his chance to establish himself in the major league rotation. Of course, it was easier for the Mets to give deGrom his shot in 2014 when the team was going nowhere. It’s a lot harder to justify such a decision when the team is in the thick of both the NL East and Wild Card races. And yet, with that in mind, the Mets should want to put the guys in the rotation that have the best chance to get batters out. Arguably, that pitcher is Seth Lugo. He just needs to get the chance deGrom did to prove it. Four pitches into the game disaster struck. Whit Merrifield lined a ball off Bartolo Colon‘s hand knocking him out of the game. The Mets are beginning a stretch of 20 games without a day off, and they were left scrambling to fill in 8.2 innings tonight. Hansel Robles stepped up big time. He would pitch a career high 3.2 innings, and he throw a career high 65 pitches. He was terrific. It started with him combining with Travis d’Arnaud for a strike em out, throw em out double play to end the first. The only run he surrendered was in the fifth, when he was stretched beyond his limits. He might’ve gotten out of the game if Wilmer Flores didn’t pull a Roger Dorn. Erik Goeddel came in and got out the jam. He would pitch two scoreless innings. Jerry Blevins added a scoreless seventh stretching his scoreless inning streak to a career high 12 innings (over 20 appearances). Addison Reed set the Royals down 1-2-3 in the eighth, and Jeurys Familia would not blow the save against the Royals. Of course, the other homer came from Yoenis Cespedes who hit it out to straight center. Cespedes would also add in a move over the shoulder catch to end the sixth. As the Mets hit two homers, they won the game. In true Mets fashion, they beat the reigning World Series Champions after getting swept by the worst baseball team assembled since maybe the 1962 Mets. It was made possible largely because of a terrific Robles performance. He got a well earned win. Game Notes: X-rays on Colon’s hand were negative. Former Met Dillon Gee relieved Royals’ starter Ian Kennedy in the fifth, and he shockingly entered to boos. He pitched a scoreless inning. In his first game back from the DL, d’Arnaud would go 0-3.